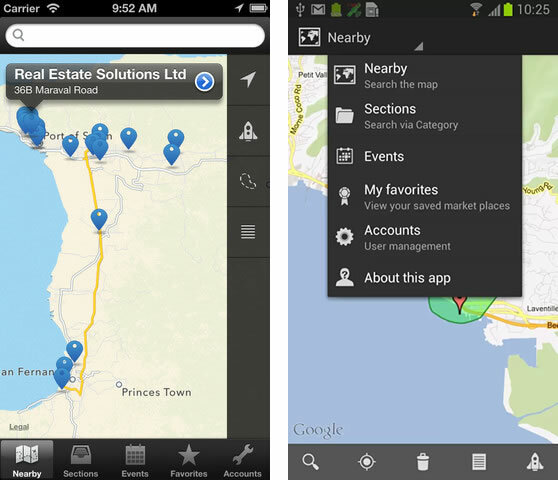 Specifically designed with Trinis in mind, the app is very easy to use. "Draw" feature - draw directly onto the map to search within an area, find exactly what you want and where. Proximity feature - find businesses by distance (relative to your current location). Image Galleries – available for EMarketplace listings, the Showroom and Events. Favorites feature - favorite anything in the app and return to it later for quick access. Search - search in any of the modules for anything, simple. Nearby – Switch locations, draw, order by proximity, display as a list, locate me, search module, tap to view, complete flexibility to find what you are looking for. Deals – Easy to understand interface, gorgeous pages, simple redeem mechanism (with email options), discounts shown. Events – Calendar view, list view, category view, access the data anyway you want. Log in – Simplified log in interface, use Trini.com or Facebook at the tap of a button. About – New about screen, email us, call us, get support – it’s all here. Categories – More natural navigation, things just make sense. Speed and Network scability is a given across the board, this app is really fast.